What happens when Leonardo da Vinci, Michelangelo Buonarroti and Niccolò Machiavelli get together? 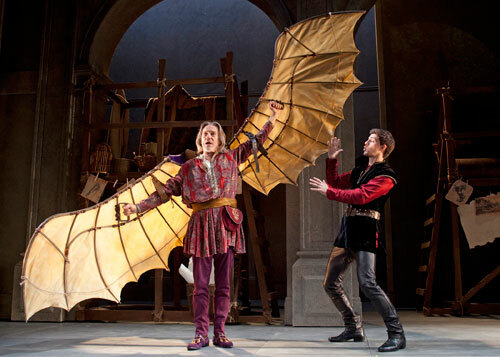 That is the delicious premise for the Old Globe’s “Divine Rivalry.” Set in Florence in 1504, a young Machiavelli (Sean Lyons) is consumed by his own machinations. Seeking to both protect Florence and advance his station, he hopes to create a citizen’s army to replace the unreliable mercenaries Florence has been using for decades. To inspire public support, he commissions/manipulates da Vinci (Miles Anderson) and Michelangelo (Euan Morton) to paint complementary frescoes depicting two of Florence’s greatest military victories. The problem? Michelangelo and da Vinci hate each other. The thought of these three intellectual and artistic powerhouses verbally sparring is almost too much to bear. But, unfortunately, the production leaves us with tantalizing possibilities and little more. The bulk of the interactions between da Vinci and Michelangelo revolve around each artist’s disdain for the other’s creations (” ‘The Last Supper’ is decaying/the Virgin Mary in the ‘Pietà’ is young enough to be Jesus’ girlfriend”). Machiavelli is an impotent observer, doing his best to avert disaster. While the interchanges are amusing at times, they leave much on the table. Imagine two of the greatest minds of the Renaissance discussing something (anything) beyond their own arrogant conceits. As is his habit, Miles Anderson is the highlight. He plays da Vinci with a playful hubris. On the other hand, Morton’s Michelangelo is petulant and insecure. He lacks the self-assurance and passion of the man who looked at a block of marble and saw David. Lyons makes a game attempt at Machiavelli, but comes off one size too small. There’s nothing even remotely scary or intimidating about him. He’s just a base manipulator. Machiavelli’s boss Piero Soderini (David Selby) takes a paternal view of his young subordinate, trying to harness his boundless energy while controlling his more extreme tendencies. Selby does an excellent job, portraying the politically astute Soderini with wit and subtlety. Too bad he and da Vinci don’t have the opportunity for an extended chat. The Globe’s set and costumes meet the mark. Special kudos for the props, especially da Vinci’s inventions. Michael Wilson’s direction makes the most of the material. The laughs are generally low-hanging, and he gets them all. That the play is based on actual events seems more a handicap than an asset. The script rarely deviates from known quarrels between the two giants. As a result, there’s nothing in “Divine Rivalry” you couldn’t glean from a freshman art history textbook. A little artistic license could have gone a long way. With a run time of less than two hours (including intermission) there was ample room to elevate the conflict. It’s a pleasant night at the theater—but the opportunities lost!